Welcome to a new week! It's Monday, 7th of October. We started very heavily, I know, but it's mostly because most people have a lot of energy on the first day of everything, and then less as time goes by. If you didn't manage to finish everything - which I think you might not have done, because you are not a freewoman like I am, you can finish things this week. You should be greeted with a nice yard, door, and an inviting entry when you come home from work. Keep looking at what would make this part even nicer, and keep this area clean and tidy until Samhain. If you didn't have time to finish the yard, porch, entry and storages last weekend, you have plenty of time this week to put things right. But - you should focus on cleaning the kitchen this week, so that you can start the holiday food preparations. Make holiday ornaments and decoration items. Make gifts, if you plan on doing something else than food gifts. A couple of weeks ago was the "Living Room / Questions Week" at Holiday Grand Plan. Do I see Samhain time primarily as a time for entertaining friends and renewing long lost acquaintances or as a time for family? How much emphasis do our Samhain activities place on the spiritual side of Samhain? How involved is my family in the Samhain preparation? What activities are particularly important to our family at Samhain? To myself? 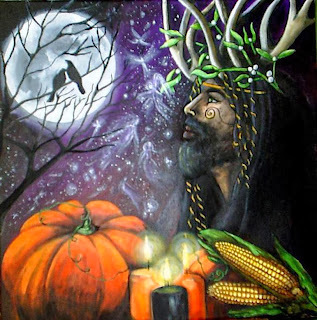 How important is an elaborately decorated house, homemade gifts or food, to my feelings about Samhain? What would my ideal Samhain be like?